It’s been a few weeks since our last trip out. We tend not to go away when the schools are on holiday, so Easter made sure we stayed home for a little while. Quite glad we didn’t go out over Easter, didn’t fancy being in the ‘van whilst Storm Katie was brewing. Easter brought the start of the season. All the sites are now open. Makes it so much easier going away for a couple of days knowing that you can pick and choose where you go. After a rough few weeks weather wise our first of three days off looked promising. Blue skies with sunshine at 9am! Let’s go! As organised as usual a last minute booking was required. 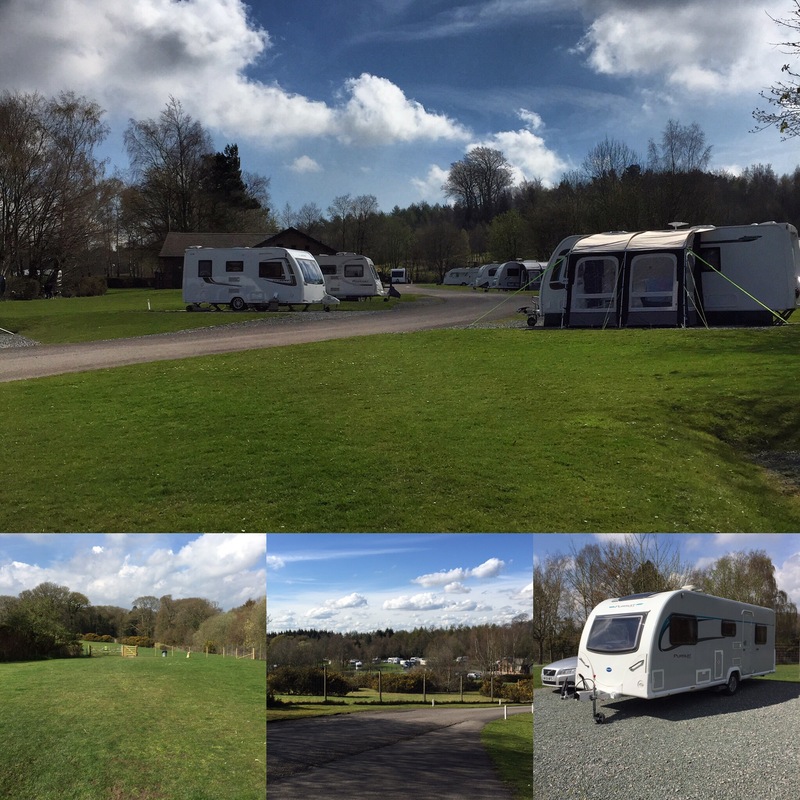 Having quite a few Caravan Club sites in the area we decided to give their new app a go. Site and dates selected, press ‘book.’ Done. Rookesbury Park in Wickham here we come. Bit of shopping done, chemist visited down to the storage site legs are up and we are off. Rookesbury Park is easily reachable from home within the hour. Traffic on the A3 as we approached was at a standstill. Nifty little bit of reversing before the slip road and we headed out through the villages towards the next junction. Thankfully all clear at this point. Having been to this site before we had an idea of the area we like to be in. Met by extremely cheerful wardens, who even recommended a pitch. On our drive around, the said pitch proved to be very spacious with a lovely view. Not for me though, a little too quiet. I like a pitch were I can see what’s going on and have passing foot traffic, for the occasional chat. The site is a mix of grass and hard standing. Due to the recent weather grass pitches were still out of order. Pitch chosen, legs down, chairs out, lunch in the sunshine. Not bad for an unorganised couple such as ourselves. The site is well equipped with a couple of extremely clean and spacious toilet blocks, complete with laundry and washing up facilities. Having recently decided that I’ve put a little bit of weight on I have been out in the last couple of weeks and treated myself to a Fitbit Charge HR Heart Rate and Activity Wristband . It was telling me that to reach my goal on my steps I needed to go for a walk. We headed off on a small walk around the site. A couple of minutes later we found ourselves wandering into the Forest of Bere. A beautiful woodland walk but quite muddy. Wednesday brought more sunshine. 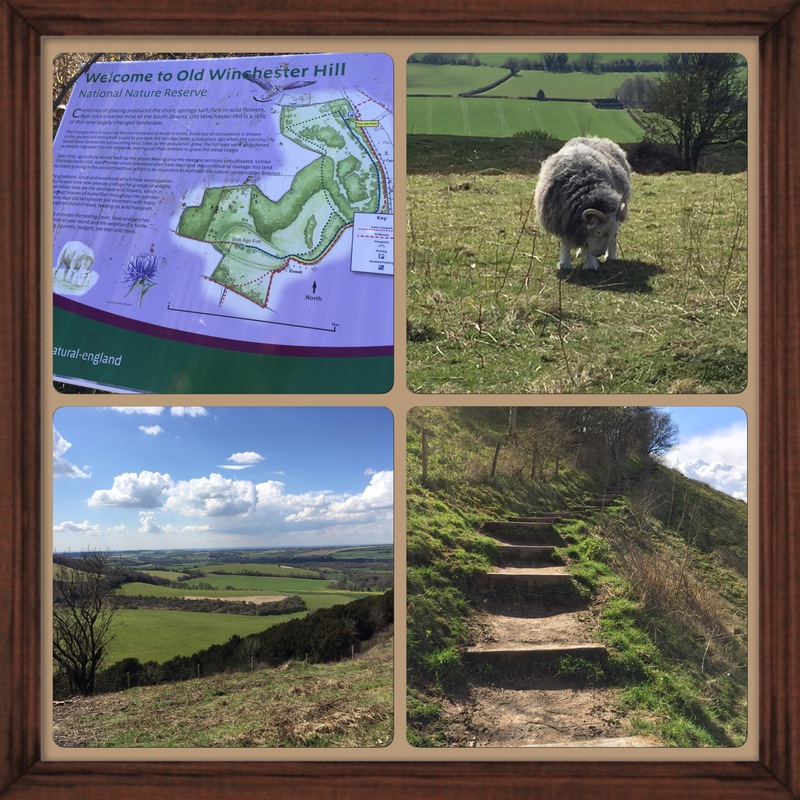 After a lazy morning and a light lunch we decided to head off to the recently recommended Old Winchester Hill. A car park at the top of the hill reassured me that there wouldn’t be much climbing involved. Boots on, off we went. 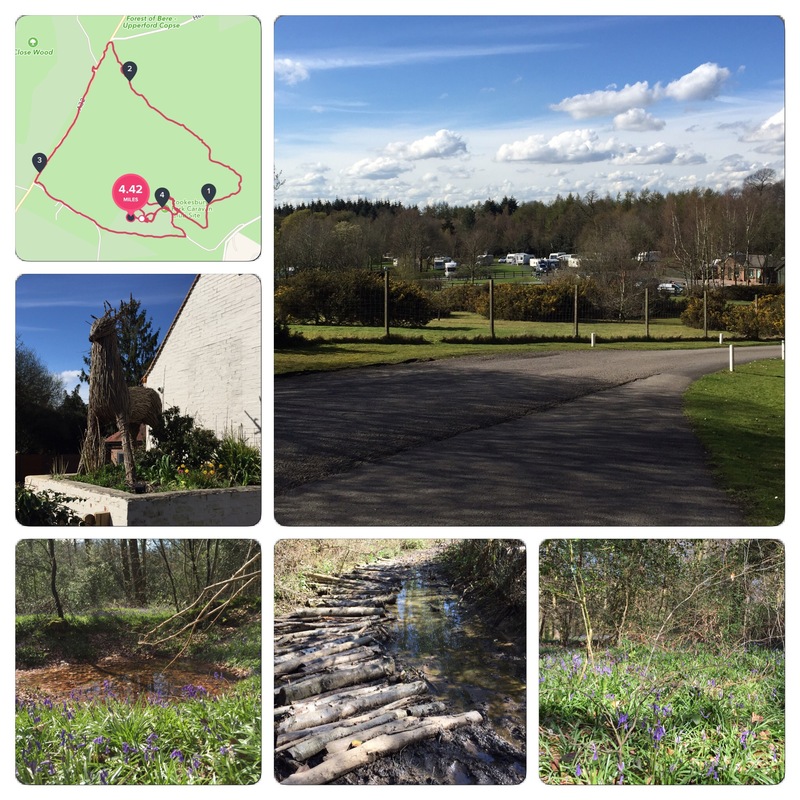 Meandering along the paths, revealed stunning views in all directions. True to form though the hubby decided to go the long way round, down a path through trees and down through more trees. All this walking downhill surely only means one thing! A long uphill climb back to the car. Sore legs, I achieved my step goal quite easily today on the Fitbit. Our final morning, glorious sunshine again. Having a 12pm departure time meant we were able to take our time and enjoy a final couple of hours before packing up. Time to finish my book. I’ve been reading Alan Bennett’s The Lady in the Van . A short book that I found on offer. Fancy seeing the film and I like to read the book before watching the film. A good read written in true Alan Bennett style. Time to pack up. We can normally pack up and be driving off the site in just less than an hour. Today was no different. Legs up, hitched up. Off we go. Love the sheep pic 🙂 great website… enjoy your adventure!! !